The KM10HS 10 inch industrial non-ferrous mitre saw cuts non-ferrous materials such as angle aluminum, brass and plastic 45 degrees left or right. The saw was originally built to a customer’s special request for a rugged, high capacity 10” mitre hi-speed non-ferrous mitre chop saw. The KM10HS 10 inch industrial non-ferrous mitre saw features cast aluminum trunnion and arm, heavy duty base, 3450 rpm spindle speed, sealed ball bearings, dual V-belt drive, and dual cam vises. Capacities are 4.5” at 90 degrees, 4” x 3.25 at 45 degrees and 2.25” at 60 degrees. The saw is available with a powerful 3HP motor in 220 volt 1ph, or 220/440/575 voltages 3ph. KM10HS 10 inch industrial non-ferrous mitre saw cuts non-ferrous materials such as angle aluminum, brass and plastic 45 degrees left or right. The saw was originally built to a customer’s special request for a rugged, high capacity 10” mitre hi-speed non-ferrous mitre chop saw. The KM10HS 10″ non-ferrous mitre saw have application in the following industries: Energy, Oil/Natural Gas, Petro/Chemical, Knife Manufacturing, Automotive, Metal Foundries, as well as many other Manufacturing and Fabrication environments that work with non-ferrous metals. All standard factory parts are replaceable no matter the age of unit. Manufactured to house a 10″ non-ferrous high speed saw blade with a5/8th spindle arbor. Optional: metered drip system, 12-M steel stand, WS-10 workstop. Options: 50HZ or 575V (call for pricing). 3PH amp draws: 220V 8.4 amps and 440V 4.2 amps. 1PH amp draws: 115V 24 amps and 220V 12 amps. 3 HP TEFC, 3 PH 220/440V (please specify voltage) or 3 HP 1 PH 220V. Manual switch. Wt. 220 lbs. Dimensions L 25 x W 24 x H 17. LESS BLADE. 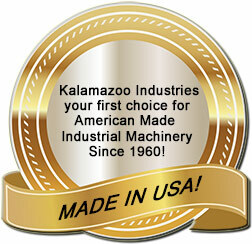 Kalamazoo Industries KM10HS Cut Sheet.